The Registered Nurse Case Manager difference, and what it means for your parent. There's a lot more to providing quality senior care than selecting and scheduling terrific, caring and compassionate caregivers. Our Registered Nurse Case Managers understand the whole picture, are medical professionals and will be involved on an ongoing basis in your parent's care - at no additional charge. No charge assessment by a Registered Nurse Case Manager– a Registered Nurse from Eldercare Home Health will meet with your parent at their home, at the hospital, retirement home, or long term care facility. The assessment provides an opportunity for us make sure that we thoroughly understand what is going on, and what their care needs are so that we can develop a care plan. It’s also an opportunity for your parent, and for you and anyone else involved in their care, to ask questions. The assessment is provided free of charge and is always conducted by a Registered Nurse or Registered Practical Nurse. Find out more about the no charge assessment by a Registered Nurse. Case Management by a Registered Nurse – this is the key difference in how we provide care. When you hire Eldercare Home Health a Registered Nurse will be assigned to your parent’s care. The RN Case Manager will be actively involved in all aspects of care – on an ongoing basis, from selecting and supervising appropriate caregivers, to meetings with the healthcare team, liaising with the pharmacist, doctors and more (see below). Hospital discharge – making the transition back home can be much more involved than you may anticipate. Because a Registered Nurse will be overseeing your parent’s discharge, we can help make sure things go as smoothly as possible. Care for clients with Parkinson’s, Alzheimer’s, Dementia and other diseases – our Nurses have the knowledge and experience to help manage the care of clients with debilitating diseases. The Nurses are particularly good at helping to get things back on track for clients whose care has gone “off the rails” before coming to us. Meetings with the healthcare team – healthcare professionals can sometimes forget that you and your family may not understand terms, processes and options. We’re here to represent your interests and to help make sure you have an opportunity to make informed decisions. Advocacy – as much as we’d all like to live in a perfect world, sometimes you need someone to go to bat for your family member – that’s us, and we will. Family meetings – we know how difficult it can be at times, to get everyone on the “same page”. The Registered Nurse Case Manager can facilitate family meetings to help bring everyone on board. “RNAO (Registered Nurses’ Association of Ontario) has long advocated for appropriate access to professional nursing services, and has expressed concerns regarding the impact of less qualified caregivers on the health of patients. RNAO’s position is that Ontarians must have access to care from the most appropriate and best-qualified care provider. It is the position of the Registered Nurses Association of Ontario (RNAO) that Registered Nurses are ideal Case Managers. RNs possess a broad nursing knowledge base that includes human/medical sciences, psychology, sociology, administration, and health care economics. This enables the Registered Nurse to identify the multiple and complex biopsychosocial needs of those receiving care. In addition, the RN’s comprehensive view of health and understanding of the scope of other health care professionals facilitates the provision of integrated care that is both efficient and effective. This also enables Registered Nurses to design, coordinate, implement, and evaluate effective and cost efficient care. Give us a call. We’re happy to have one of our Registered Nurse Case Managers provide whatever insight they can, and to answer any questions you may have. We want to make things as straightforward for you and your parent as possible. That’s why we charge only for the time the Personal Support Worker (PSW) caregivers are providing care, there are no additional charges for any of our other care services. And, while you may think that a service like ours would cost more, it doesn’t. 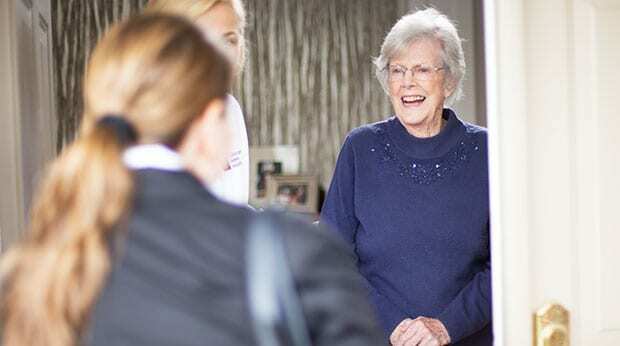 Why choose us for home care? In summary: Get the senior care your parent deserves, and the relief you need, with Registered Nurse supervised and case managed PSW care, from Eldercare Home Health.